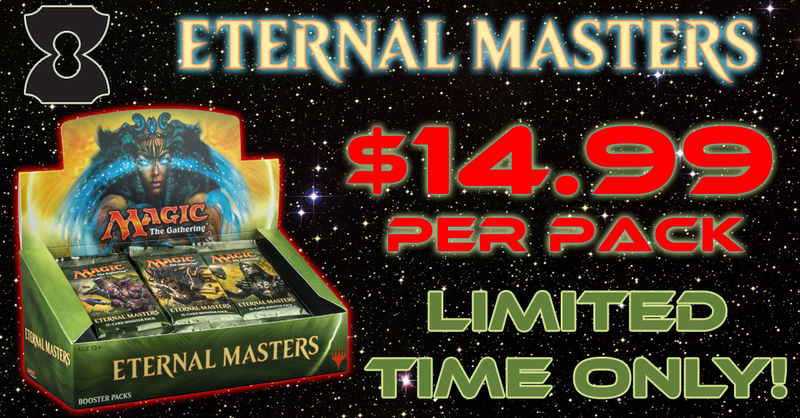 So it seems Wizards has deemed it appropriate to print a second extremely short run of Eternal Masters. With that being said, we have a limited supply of boxes coming in to the shop this Thursday (12/1/16). We will not be selling many by the box, as to allow for everyone to have access to the amount of packs we get in. Although we will be offering a Draft on Saturday, December 3rd for $45 with 4 packs in the prize pool( check http://www.theendgames.co/events). Individual packs will be available for purchase at $14.99 per pack come this Thursday when our shipment arrives. This entry was posted in Magic The Gathering, Store News and tagged Eternal Masters, MTG, Reprint, Wave 2. Bookmark the permalink.